﻿ Fun Easy English - Environment - Global warming - Climate change Indicators: Snowfall. 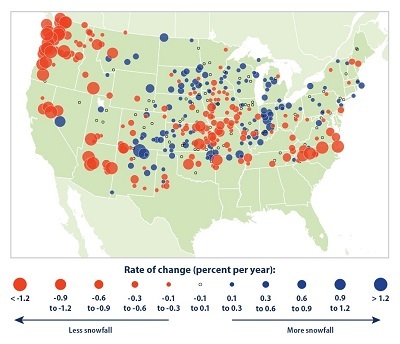 This indicator uses two different measures to show how snowfall has changed in the contiguous 48 states. Total snowfall has decreased in many parts of the country since widespread observations became available in 1930, with 57 percent of stations showing a decline (see Figure 1). 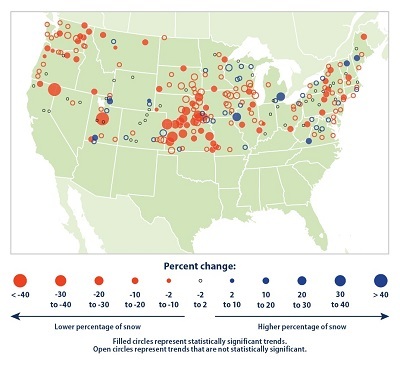 Among all of the stations shown, the average change is a decrease of 0.19 percent per year. In addition to changing the overall rate of precipitation, climate change can lead to changes in the type of precipitation. One reason for the decline in total snowfall is because more winter precipitation is falling in the form of rain instead of snow. Nearly 80 percent of the stations across the contiguous 48 states have experienced a decrease in the proportion of precipitation falling as snow (see Figure 2). Snowfall trends vary by region. The Pacific Northwest has seen a decline in both total snowfall and the proportion of precipitation falling as snow. Parts of the Midwest have also experienced a decrease, particularly in terms of the snow-to-precipitation ratio. A few regions have seen modest increases, including some areas near the Great Lakes that now receive more snow than in the past (see Figures 1 and 2). Snowfall is an important aspect of winter in much of the United States. Many people depend on snow to provide water when it melts in the spring—including 60 million people in the western United States1—and many communities rely on snow for winter recreation. Some plants and animals also depend on snow and snowmelt for survival. The amount of snow that falls in a particular area directly influences both snow cover and snowpack, which refer to snow that accumulates on the ground (see the Snow Cover indicator and the Snowpack indicator). Warmer temperatures cause more water to evaporate from the land and oceans, which leads to more precipitation, larger storms, and more variation in precipitation in some areas. In general, a warmer climate causes more of this precipitation to fall in the form of rain instead of snow. Some places, however, could see more snowfall if temperatures rise but still remain below the freezing point, or if storm tracks change. Areas near large lakes might also experience more snowfall as lakes remain unfrozen for longer periods, allowing more water to evaporate. In contrast, other areas might experience less snowfall as a result of wintertime droughts. Changes in the amount and timing of snowfall could affect the spawning of fish in the spring and the amount of water available for people to use in the spring and summer. Changes in snowfall could also affect winter recreation activities, like skiing, and the communities that rely on these activities. This indicator tracks total snowfall as well as the percentage of precipitation that falls in the form of snow versus rain. These data were collected from hundreds of weather stations across the contiguous 48 states. Total snowfall is determined by the height of snow that accumulates each day. These measured values commonly appear in weather reports (for example, a storm that deposits 10 inches of snow). Figure 1 shows how snowfall accumulation totals changed between 1930 and 2007 at more than 400 weather stations. These stations were selected because they had high-quality data for this entire time period. Figure 2 shows trends in the proportion of total precipitation that falls in the form of snow during each winter season. This is called the “snow-to-precipitation” ratio, and it is based on comparing the amount of snowfall with the total amount of precipitation (snow plus rain) in each year. For this comparison, snow has been converted to the equivalent amount of liquid water. These data are available from 1949 to 2016. 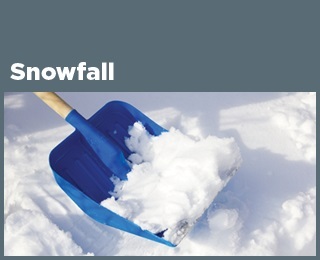 Several factors make it difficult to measure snowfall precisely. The snow accumulations shown in Figure 1 are based on the use of measuring rods. This measurement method is subject to human error, as well as the effects of wind (drifting snow) and the surrounding environment (such as tall trees). Similarly, snow gauges for Figure 2 may catch less snow than rain because of the effects of wind. Steps have been taken, however, to limit this indicator to weather stations with the most consistent methods and the highest-quality data. As a result, some parts of the country have a higher station density than others. Both figures are limited to the winter season. Figure 1 comes from an analysis of October-to-May snowfall, while Figure 2 covers November through March. Although these months account for the vast majority of snowfall in most locations, this indicator might not represent the entire snow season in some areas. Most of the data shown for mountainous regions come from lower elevations (towns in valleys) because that is where weather stations tend to be located. This indicator shows trends based on two sets of weather records collected and maintained by the National Oceanic and Atmospheric Administration. Figure 1 was adapted from an analysis by Kunkel et al. (2009) based on records from Cooperative Observer Program weather stations. Figure 2 is an updated version of an analysis by Feng and Hu (2007) using data from the Global Historical Climatology Network. Additional information about the Cooperative Observer Program is available online at: www.nws.noaa.gov/om/coop. Information about the Global Historical Climatology Network can be found at: www.ncdc.noaa.gov/oa/climate/ghcn-daily. This figure shows the average rate of change in total snowfall from 1930 to 2007 at 419 weather stations in the contiguous 48 states. Blue circles represent increased snowfall; red circles represent a decrease. This figure shows the percentage change in winter snow-to-precipitation ratio from 1949 to 2016 at 246 weather stations in the contiguous 48 states. This ratio measures what percentage of total winter precipitation falls in the form of snow. A decrease (red circle) indicates that more precipitation is falling in the form of rain instead of snow. Solid-color circles represent stations where the trend was statistically significant.